Click on the boxes below to expand them and see more information. Please click here for a Google map to get directions. Broadway Cars: 01635 847784 | www.broadway-cars.com (set rate of £15 per car Mon-Sat / £22.50 per car on Sundays / 8 seat mini bus, MPV £22.50 Mon-Sun). Pushchairs are not permitted in the Castle, but can be left in the front hall, space permitting (at your own risk). Dogs are not permitted in the Castle, Exhibition and Gardens with the exception of assistance dogs. They are welcome on the public footpath which runs through part of the estate but please do ensure they are kept on a lead at all times. (Please note when the Castle is open to the public none of the public footpaths are accessible from the car parking area. Any visitors wishing to walk before or after visiting the Castle need to park off of the estate). Photography is not permitted within the Castle but it is allowed outside for personal use only. Drones, however, are not permitted anywhere on the Estate. 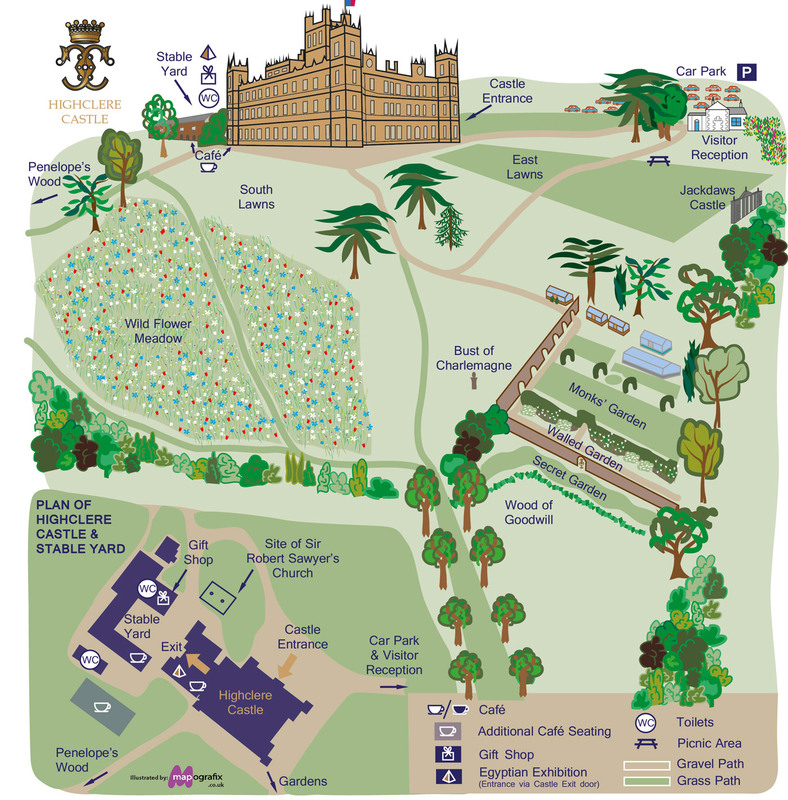 Highclere Castle is a historic building but disabled access is possible for most areas. There is no lift, however, we provide photographic albums to enable visitors to look at some of the bedrooms on the first floor. Wheelchairs are welcome around the Castle and in the Egyptian Exhibition (access to this is via the Courtyard at the back of the Castle). It is not possible to bring motorised wheelchairs into the Castle but they are welcome on the paths around the lawns. A limited number of manual wheelchairs are available for use by disabled members of the public within the Castle. We would advise pre-booking with the Castle Office due to limited supply. The Gardens and Grounds are open to the visiting public during public opening times. Whilst there are some gravel paths around the Castle lawns and through some of the Gardens, the Woodland Walks are rougher grass paths as are the paths through the Flower Meadow in the summer. The Tearooms are open from 9:30am during public opening times for morning coffee and teas made in the Castle kitchens. The Tea Rooms are also open for hot light lunches from 12noon until 2pm and a choice of light bites will be available throughout the day. The Castle Gift Shop is open from 9.30am and offers a wide selection of gifts including stationery, bath products, chocolates, tea and biscuits, china mugs, books and souvenirs. You can also order online form the Castle Gift Shop here. You are welcome to enjoy a picnic in the gardens however, please note that deliveries from outside caterers are not permitted. Highclere Castle is pleased to be associated with the Historic Houses and welcomes HH members into the Castle free of charge. However, whilst we do our best to accommodate all visitors we cannot guarantee HH members admission at a specific time. Members of the HH who wish to visit the Egyptian Exhibition, must purchase a separate ticket available from Visitor Reception at the Castle Main Gate or at the door to the Exhibition. Please ensure you bring your membership card with you when you visit. A valid Blue Peter badge and winner's card allows free entry to the Castle, Exhibition & Gardens for children aged 6-15 years old, when accompanied by a full paying adult visitor. Only one Blue Peter badge per one adult ticket. Blue Peter badge tickets cannot be purchased in advance. For full terms & conditions please see the BBC website. Smoking is not permitted within the vicinity of any building at any time. This information is correct at the time of publication but may be subject to change. Please call our 24-hour telephone information line on 01635 253204 to confirm before travelling.